A grown hen will eat 120g-140g per day. A 7 kg feeder is suitable for up to 10 hens. Feed should be available at all times in a tube feeder (either hanging or floor standing), placed outside the house to discourage the hens from spending too much time in the house. 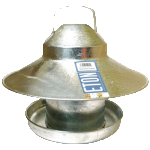 Feeders are available in galvanized steel, or plastic. Protect the feeder from the rain and wild birds, with the use of a top-hat, or placing in a covered run. Feed ‘plain’ growers pellets for pullets below 20 weeks of age. Layers pellets are introduced at 20 weeks. Pellets are more practical and less wasteful than mash for free range birds.